Our Composite Recurve Bow is designed for Horseback Archery and can be used for target shooting or Hunting. The handle riser is reinforced by an ash wood grip. The Limb tips are come with shaped nocks for the bowstring loops. Our Eastern Reflex Deflex Bow was designed to capture the Art of bow making and the Tradition of hunting with a traditional bow. Built for speed and performance our Eastern Reflex Deflex Bow is great for either target practice or hunting. Our Genghis Recurve Bow named for the Mongol khan is made from pre-stressed layered ash and fiberglass. Leather wrapped grip reinforced with ash. Great for target shooting, re-enactments or Hunting. Standing approx 58" when strung, the Yellow Osage Horse Bow really packs a punch. Black Accent wraps and glass contrasts nicely against the "yellow" osage orange syhas, handle and limbs. The Kestral Horsebow is hand crafted and designed for use as a hunting bow. The Kestral bow like most horsebows has a smooth draw and quite release. 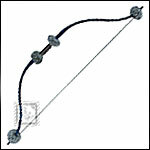 This horsebow is compact and easy to maneuver in the woods.